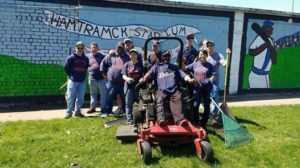 The volunteer grounds crew at the Hamtramck Baseball Stadium will now have a new turf to take care of – thanks to a successful online fundraiser. Hamtramck’s historic baseball stadium scored a big win. The online fundraising effort to raise $50,000 was met on Wednesday – a week before the fundraiser was scheduled to end. That $50,000 will now be doubled, thanks to a matching $50,000 grant promised by the Michigan Economic Development Corporation. The fundraiser was sponsored by both The Friends of Historic Hamtramck Stadium and the Piast Institute. Hamtramck Public Schools Superintendent Tom Niczay, who has been a supporter of the stadium renovation, was overjoyed. “We are very gratified by the groundswell of support for our cause, and we look forward to beginning the restoration of the historic field for baseball, soccer, and cricket usage. “FHHS and Piast would like to individually thank our most generous donors: Jack White of Detroit, whose $10,000 kicked off the campaign, and Detroiters Dr. Kerry Ann Rockquemore and William Haupricht, whose $10,000 donation put us over the top. “Abdallah Sheik, CEO of Captain Jay’s Fish & Chicken restaurant chain, graciously donated $2,500 this week to get us closer to our goal. Debra Williams of Sterling Heights also donated $2,500 on Day 2 of the campaign. “More than 300 individuals have contributed to our campaign so far, including all members of the Friends board of directors and all Piast employees. The people who donated deserve a “thanks”!